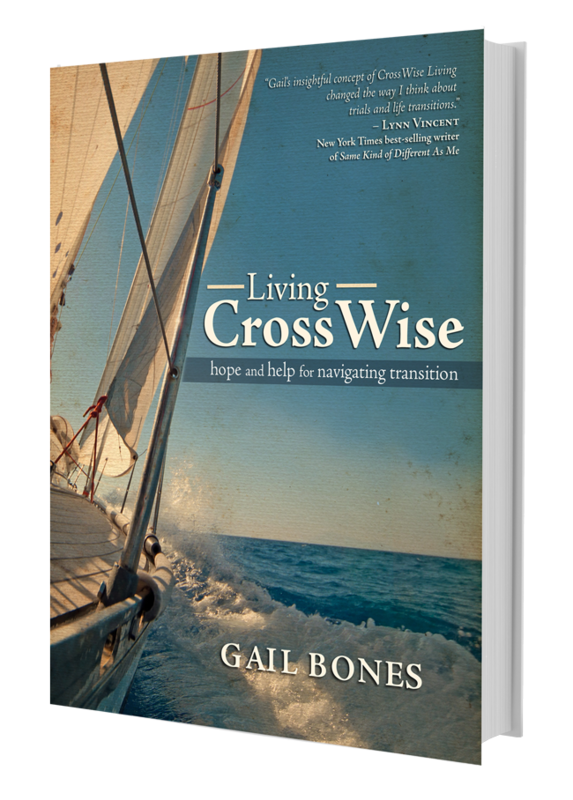 Gail’s 12 week Bible study Living CrossWise: Hope & Help for Navigating Transition combines metaphors from sailing with inspirational stories about life’s transitions and topical Bible study to promote cross-generational mentoring relationships. Everyone faces difficult life transitions on a regular basis. Living CrossWise teaches readers how to harness the power of the winds of change that propel us on a zigzag course through life’s transitions. Inspirational personal narratives, in-depth Bible studies, and pertinent discussion questions illustrate the three essential spiritual practices of Inward Inventory, Pinpoint Prayer, and CrossWise Counsel. The cross provides a pattern for the three kinds of questions we must ask to successfully navigate transition. The vertical plank encourages us to look to God for specific guidance (Pinpoint Prayer) while we engage in disciplined self-reflection about the practical details of our lives (Inward Inventory). The crosspiece shows us the value of living life with arms wide open to the input of both the generation preceding and the one following us (CrossWise Counsel). The importance of cross-generational mentoring relationships is underscored in this interactive women’s ministry resource. Women’s ministries will use this study as a tool for mentoring programs and Bible study groups. Because it is designed to promote and facilitate cross-generational mentoring relationships, its range of usefulness will extend from high school students through senior citizens. The biggest age group, Baby Boomers, is now heading into retirement and seeking opportunities to invest in the lives of young people—this study will provide the structure and motivation to help them attain their potential at this influential stage in life. Dr. Bones and her ministry has been commended by Christian authors, leaders and ministry directors including Pam Farrel, Wayne Rice, Leanna Tankersley, and Virginia Friesen. It’s a rare and beautiful moment when a worship leader takes command of a stage, a room full of people and ultimately lifts all of us up to the Lord as a sweet fragrant offering.